The planet is always on the brink to collapse. 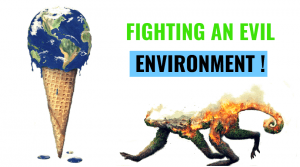 What human beings brought up to this orb, and what they are drawing on every second is always a matter of concern, promoting environmental degradation. Disasters can be natural and man-made, pertaining to a great extent, along with poverty and pollution to count. Consequently, the world is fighting these backs by making amends in various meets, specifically the United Nations strata. These few things listed, are accounting as a measure to tackle the subsequent effects of man-made or natural issues. Refrigeration/air condition is one of the sole reasons of global climatic effects, the neon gas takes into a large consideration of ozone depletion. This can be modified with some level of equipment such as Nitrogen gas to be used in freezing processes. Additionally, afforestation is also on the list of affecting several tangible phenomena, coinciding with some natural disasters. Certain modified data provided by various analysts, including Frischman, points several other factors like Solar Farms, Education of Females and even implementing plant-rich diets being a major driving factor. These processes get a direct or indirect view on the listing of change happening worldwide. Consequently, how much carbon dioxide, in terms of gigatonnes are into emissions each year, is recorded and the sole aim lies in cutting it in a span of three decades. The overall cost of manipulating the planned process is fairly huge since the involvement of many factors contributes. Ordinarily, over the next few years, an anticipation of around 1 trillion Dollars is projected to be lashed out in the sustenance of the methods. This estimation points out a more enlarged global GDP of over 80 Trillion Dollars a year. Subsequently, Frischmann points this is less than 1.25% of the price for the potential strategies of saving the planet from the verge of destruction and global meltdown. Posted in Market Research and tagged cleantech, Environmental Degradation, Global Meltdown, Globalization. ← Oil and gas market senses the heat!